Their ‘hubby’ and ‘wifey’ T-shirts are kind of precious, no? 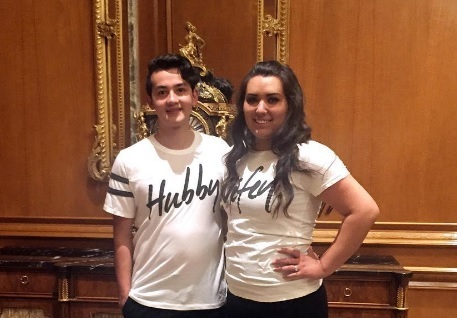 A longtime 16 and Pregnant couple has finally tied the knot! Last weekend, Izabella Tovar of Season 3 married Jairo Rodriguez, the father of her two children. Izabella is one of only a few girls from the show (10 to be exact) to still be in a relationship with the father of the child born on ’16 and Pregnant.’ Even fewer girls have married their baby’s father, making Izabella’s story unique. We first met Izabella way back in 2010 when she was a pregnant 15-year-old hiding her pregnancy from her Catholic school friends. Izabella and Jairo have come a long way since then. While raising their son, Enrique (nicknamed Henry), they welcomed another child, Anatazia in 2014, and last month, Izabella graduated college with her Bachelor of Science degree. According to Izabella’s social media posts, the wedding took place in Utah. The couple said their vows outdoors under a beautiful gazebo and their two children played an integral part of the ceremony. Izabella wore a strapless white gown while Anastazia wore a sweet blush pink dress. Jairo and Enrique were dapper in matching black suits. Two days after the wedding, Izabella reflected on her life with Jairo. The wedding has been a long time coming. The couple has been engaged since 2010, but Jairo proposed twice. According to Izabella’s original wedding blog post in 2010, the first proposal took place the beach in Puerto Rico. The couple originally planned to get married in June of 2013, but decided to postpone the nuptials. Going forward, Izabella plans to attend medical school. When we spoke with Izabella in May, she praised Jairo and her parents for always being there for her and supporting her dreams. Check out a clip from Izabella’s wedding video below. Yes, they were spoiled, yes they totally had a free ride, yes her parents paid for everything. However, I will give credit were credit is due. She graduated high school, and then graduated college. Remember when Chelsea didn’t even bother to get her GED for years? And who an forget Maci’s 8 year Associates degree. She had all the help in the world, and she used all of it. People always seem to find it necessary to point out how much support they got from her parents but you know what-she isn’t the only one who had parents willing to help-she just was able to make the most out of the help she was offered. There were others with parents that had the financial means to help them get to this level, but they didn’t do the work. This girl did. And it’s nothing to be ashamed of. Congrats. Proof positive that people can overcome any obstacles IF they are mature, dedicated and determined. God bless you and your family. So I’m drawing a huge blank as to who this is….can someone remind me of something specific that happened on their episode? What was the drama about? Or was there no drama and that’s why they’re successful? I remember her because (I’m pretty sure) she was the one that hid the pregnancy from everyone (family and friends) and then couldn’t understand why all her friends were mad and weren’t supporting her. I don’t remember if they were hurt that she hid it or disappointed that she was pregnant. I also think that she was incredibly spoiled and her parents basically paid (pay) for everything including supporting the boy. I might be mixing that one up with someone else. awww! I always liked them as a couple. Happy for them, and glad Izabella graduated college….How about we replace Leah, or Farrah, or Jenelle with this couple? Thumbs up for both of them! Mom at 15, another child after that and still manage to get your degree. Most of the TM girls should take notes from this girl. So should a lot of the baby daddies. Neither of them have finished their degree since 16&p. And I believe I read on here that she got her degree in 3 years instead of the typical 4. I love that one of the girls that did not go onto Teen Mom, with all the “fame and money” ended up getting what they all want so badly..a happy little family.